Please submit any new problems to the database. When the describing new problems in relation to existing problem mention the version of the guide used. Password is bouldering all lower case. Fliddy the Postoffice cat 6c? Antrim Fairhead Murlough Bay On the 'When Molesy Met Melkor' boulder. Start on the jugs of Molesy then throw out to the crimp up and left. (Molesy Met Melkor goes straight up the middle of the boulder using a crux undercut for the right hand.) ? ? - 5 Wicklow Glendo beyond Big Jane The same tall boulder in the scree southwest of Big Jane: the side facing the river. Mantel 5 Wicklow Glendasan Boulder Alley Just right of the mouth of the alley is a short wall with a slabby top, mantel this. Dave Flanagan 2006? Permadry 7a? Wicklow Glendo scree Roof crack in a cave high in the scree, 100m straight up above superstars of the BMX. 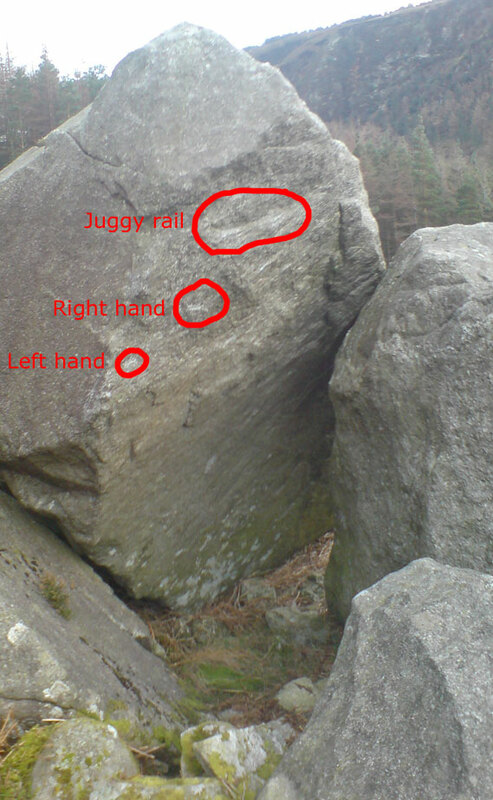 Sit-Start on the big juggy crack, up to the sidepull and crack, finish on the top jug far left. The Nose 7b Louth White Bog The Nose The big pointy nose at the top of the scree. waterline 6a Louth White bog ship boulder sit-start as for the Leak but traverse the long horizontal break and finish round the corner to the extreme right. Dec's sit-start 6b Louth White bog Starter arete To the right of the Starter arete is smaller boulder with a couple of sit-start deadpoints: Dec?s sit start takes the round corner and Pierre?s sit-start the overhanging mini-arete. - 6c Louth White Bog the Pebble Small overhang to the rear of the pebble. the Egg 7b Clare Doolin Base Camp Sit-start egg problem, just left of "Hider". lower turnpike arete 6c+ Kerry Gap of Dunloe TurnPike Rocks The problem begins at the very bottom of the roadside arete, being the boulder on the left as you look down the valley towards Killarney. Start on a side pull, slap to the sloper and continue on crimps until the tricky dyno to the monster bucket on top. Entertainment for the Short 2.0 5+ Wicklow Wicklow Gap Electric Mountain On the face below problem 5. Contact 8a+ Wicklow Carrigshouk - The imposing arête of Carrigshouk is one of the finest and most striking lines in Co. Wicklow and has been a long standing project for years. Climbing the rhs of the bulging arête, a dynamic dead point to a slopey edge leads to delicate climbing above with a tricky move to gain the top. Delusions of Grandeur 6b Wicklow Lough Bray Grand Hotel Might have gone before. The right arete on the boulder, ss right hand fingers in the crack and left hand on the arete, up to the apex and over. Short but worthwhile. Clio Intacto 6b Wicklow Lough Bray - On a small block hidden in heather right of the path before you reach the Lakeside boulder. Sitstart the short arete using sidepulls in the thin crack for the left hand and a rounded edge for the right hand. Musophobia 6b Wicklow Foxburrow boulders White Elephant boulder The sloping South Eastern arête from sit, on one impressive pure White clean cut granite giant! Witness The Shitness 4 Cork Barley Cove Roof section On the smaller cove of Barley Cove beach in West Cork there is a small roof with a spacious ledge on top. This is on the right hand side of the cove as you look at the sea. Problems are on low quality rock and mostly easy, but worth a pair bringing a pair of shoes for on a sunny day. Another Duffy Problem......... 6c? Wicklow Glendalough The Ruins Not a new Problem, done years ago by Masters Duffy, but never recorded and it's a beauty. Location: In a small pit About 4/5 meters behind Problem 14, it faces towards the ruins. Sitstart on the crimp, with both hands!, on the left side. Then, follow the arete rightards, through the perfect holds to the top. Michael Duffy Years Ago. Foxy 5+ Wicklow Glendalough Behind the Rails a few meters behind the rails, to the right of problem 30. A low ball sit start face climb that faces away from the path and towards the cliffs. start from the obvious ramp with sketchy feet - reach to a small hold out right, right foot out to small foot holds up high and turn the left hand to a mantle on the opening ramp to reach the top. Short but sweet warm up. Sweet Pea 6b Donegal Polldoo Glen Split Pea Rock Project 9 in the guide. Nice moves on perfect rock. Fun. Brokeback 6b Wicklow Black Castle Biker Cove Problem 4 in topo. Start from slopey shelf and use positive crimps to gain the highest pocket. Not topped out as the rock quality deteriorates rapidly. Vision of Sharks 5 Kerry Black Valley - Lough Reag Submarine The Submarine is a large huge boulder halfway between The Wave and Rock´n Lock. Traverse the upper edge from right to the left on its upper edge. Finish when you can step on the next boulder around the edge. The arete at the southwestern edge has a nice SS, 5. People of the Sun 8a+ Wicklow Glendalough Crackland Small underground room up and right behind Black Art. - 5 Wicklow Glanekeera - This is the line up the left side of the face of the first boulder you pass on the walk in to Glanekeera. Use the left arete to climb the face. MCA 5+ Wicklow Glanekeera Vert wall The line of undercuts/sidepull up the middle of the vertical wall. Bit of heather top out but there are good holds. Stainless Steel 6b+ Wicklow - The Gully Block Bouldering in Ireland, page 67, problem 3. Let it Shine 7b+ Donegal Carrickfinn - Problem / proj 5 in the guide - the high layback. Consolation Prize 3 Down Chimney Rock Summit Block The curving crack system left of Cloud 9 and directly across from wee arete. Bella 5a Down Chimney Rock Slab down hill from the Slab are 2 smaller blocks - the upper grey and the lower white. - 6B Dublin Scalp Petrol Station The beautiful crack to prickly topout James Gernon ??? Poached Egg 5+ Clare Doolin Base Camp Sit start to the "Egg" problem. Starts on the bottom left of Egg. Barnacles 7a Kerry West Cove - Location: 51.762508 degN, -10.054533 degE. Starts on right matching on pinch, moving up left on roof, top out on left most en-echalon fracture. Boulder is in inter-tidal zone, 3 or 4 hour window around low tide to climb. Boulder needs to be cleaned with wire brush/screwdriver/sharp implements in order to remove barnacles. But once done fantastic boulder. The Lyrids 7A Wicklow Glendalough Chillax Across from Enter the Denny. Crouch start. Thunderflash 6b wicklow Glendalough path between 42 and 44 SS on two small crimps, with diagonal rail for feet, Follow a mix of small crimps and sloper to the top. Nilpferd 7A Wicklow Glenmalure Hollywood Start double toe hooks on the rail, hands down low and left on two obvious holds. Higher start possible starting matched on the jug with crux first move. Fly or die 7a Louth windy gap The sinister Block This boulder is in the forest about 50m below the thing in the forest. In the woods to the right of the matterhorn block. excellent problem up the beautiful arete. SS. exciting topping out above the "sinister block" ? sammy? 2015? Finn slattery 5c Kerry Kinard Kinardbeach 50 metres to right of beach entrance. Obvious green rock 3 metres high route goes up southern face without using obvious slope from top left to middle bottom of face. Diggers With Attitiude 6a Dublin Scalp N/A From the Dublin end boulder walk up the hill towards the left. About 2/3rd of the way up before you come to the quartz crag there is a rock face approx. 3 meters under an old oak tree facing the root. Start on good hold at the left side of the face reach far left to a good small hold. Step around the arete using a good open hand and delicate feet before reaching for a jug at the bottom of the short groove. Blue Hook v4 Clare Doolin Splashback boulder First ascent of a fine problem on the 'Splashback' boulder by Sarah Hoare. Called 'Blue Hook'. A guess at a grade puts it at v4/v5, but is was climbed in poor (damp) conditions so it's hard to say for sure. Mr Ages (ss) 6b Dublin Scalp Petrol Station Sit start version of the Mr. Ages. Starting on the ground directly below the nose pull onto the climb using the corner flake and a slopey grip at the end of the nose. Slap along the edge to get into the starting position of Mr. Ages. Curva 5+ Dublin Scalp Petrol Station Up the hill to the left of Maximus and lee of stone. Small holy tree at the base of the rock. Perp on a Chain Link fence. F4 Clare Doolin The Zoo. Interesting moves up an overhanging wall, with a spicy rockover to exit. This bloc was recently exposed when the bloc on the South side of the 'Up the Alley' area was moved by 2017-18 storms. The Good Fight 5 Clare Doolin The Zoo Interesting moves up an overhanging wall, with a spicy rockover to exit. Cough Medicine 6B+ Dublin The Scalp Roadside Between the road and the Casbah, small block leaning on an even smaller one. The Bow Dyno 5+ Dublin Barnaslingan Barnaslingan Forest Just have to catch the two mini jugs. The Bow Traverse 5 Dublin Barnaslingan Barnaslingan Forest Start from right and finish left. 25 4 Wicklow Carrigshouk 23-24 boulder Right side of arete from problem no. 24 in bouldering Ireland 1st ed. Start high left foot. Careful of landing. P Poland? Feb 2019? 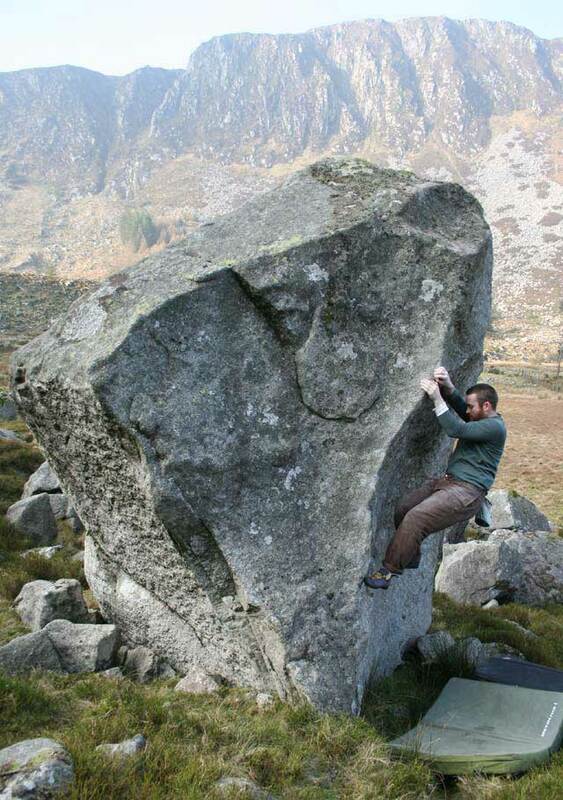 16.2 3 Wicklow Carrigshouk 16 Boulder Scooped arete on the boulder with problem no.16 (guide 1st ed) P Poland? Feb 2019? 8.5 3 Wicklow Carrigshouk 7/8 boulder Arete on L/H side of boulder P Poland? Feb 2019? Sit start on bottom left, climbing right and up arete P Poland? Feb 2019? 15.2 4+ Wicklow Carrigshouk between 15/16 Boulder between problems 15&16. Centre of slab at highest point (not using ledge to right) P Poland? Feb 2019? Step To Enchantment 6B+ Wicklow Camaderry Step2 Start at the lip with left hand on a good hold, right hand on a pinch. A right hand undercut then lead to smeary rockover. Breadcrumb Trail 6B Wicklow Camaderry Concave Slab Left of the big concave slab half way up Camaderry on a plateau. Smear your way up the slab to a sloper, then grab a handful of the lovely right arete to claw your way to victory.